Savannah, GA, is a city brimming with history. You can visit Savannah’s excellent museums or take a walking tour guided by a local expert. One of the most popular things to do in Savannah, GA, is to visit the historic district. This area encompasses rich Savannah history and is a popular tourist attraction for many reasons. Spend a day admiring this city’s charm and history when you go shopping in the Savannah Historic District. Visiting and shopping in this area is just one of the many incredible things to do when you visit Savannah. For more ideas for what to put on your Savannah, GA, itinerary, request a copy of our complimentary Insider’s Guide! The Savannah Historic District is listed as a National Historic Landmark. This district is representative of James E. Oglethorpe’s vision for Savannah’s city plan. Oglethorpe had a deep influence on Savannah. Our inn is even located on a historic downtown road with his namesake! Much of his vision has remained the same. Some examples of this include various squares and the continuity of Georgian-style architecture. Within the blocks of the Savannah Historic District lies some of the finest, most authentic Savannah shopping. Broughton Street is home to some of the finest things to do in Savannah. You can see a show at The Lucas Theatre or browse the Gutstein Gallery that’s filled with famous art. Among all the great activities on Broughton Street is some of Savannah Historic District’s best shopping. One of the most popular places to shop on this strip is the two-story Paris Market. Or, stop in Civvies to browse clothing trends across a variety of eras. The Savannah City Market evolved from something of a market for fresh produce to the charming, outdoor market it is today. You can purchase locally-crafted jewelry, sweets, and more! Dream of all the places you could visit in a single afternoon with their list of shops! After you’ve spent the afternoon shopping in Savannah Historic District, indulge in a five-star dinner at some of the most romantic restaurants in Savannah. Some are even located in the historic district! After your meal, come back to our inn to delight in the most authentic lodging there is. 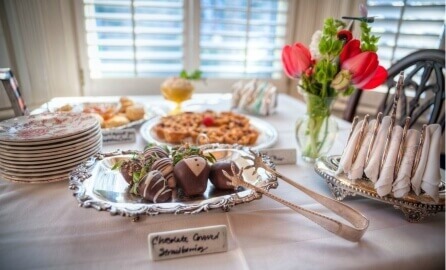 Savannah’s charm is a top priority to us at Ballastone Inn. In keeping with this, our Southern hospitality encompasses region traditions like high tea and after-dinner dessert wine and small snacks. 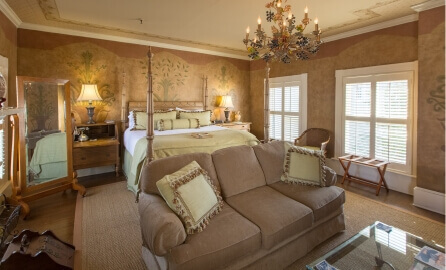 Reserve your guest room at our inn on your next Savannah, GA, getaway. All of our accommodations include access to our luxurious amenities. Booking with us also means that our concierge can help you schedule a tour with Savannah’s best guides who work directly with us. For even more elegance, stay in our Victoria Suite. 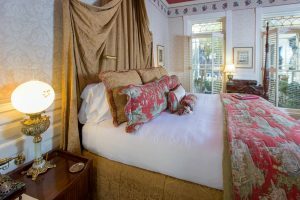 This room is adorned with French-inspired decor and nods to Queen Victoria. Make sure you browse all 16 of our accommodations and book your favorite! What Are the Most Romantic Restaurants in Savannah, GA? 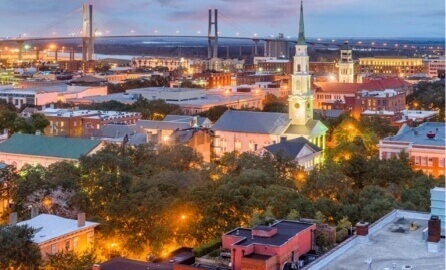 — When’s the Best Time to Travel to Savannah, GA?